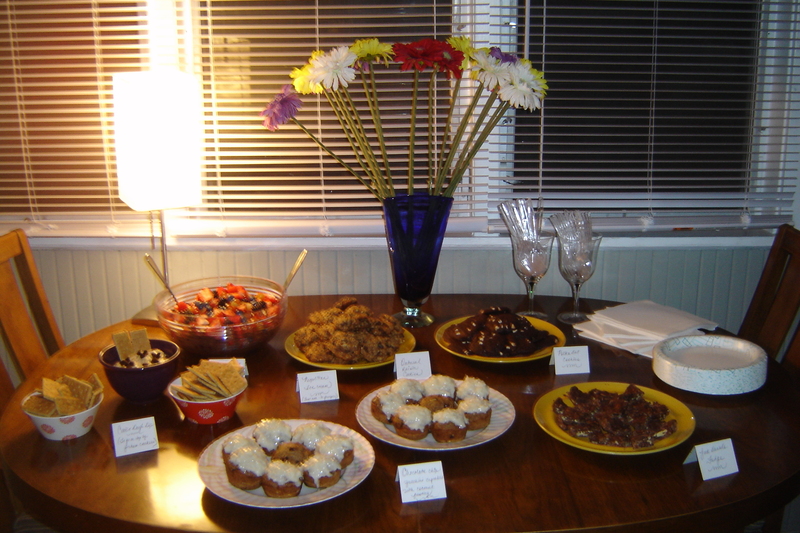 The food from a dessert and wine party that my friend and I hosted earlier this year. I’m trying to get better at cooking for myself. It can be tough when you work late and don’t feel like “working” more in the kitchen when you get home. But I know some people who say that cooking relaxes them and gives them the chance to be more creative when it comes to food. I want that to be the case for me, too. I’ve found that weekends are a good time to experiment in the kitchen, as are late nights when I’m forced to cook for a potluck or a get-together the following day. In recent weeks, I’ve done my fair share of late-night baking and even managed to set off the sensitive fire alarm in my apartment twice — both times after midnight. Oops. Cilantro and lemon hummus and tomato basil hummus: I’ve tried several of the About.com hummus recipes, but these two have been my favorite so far. 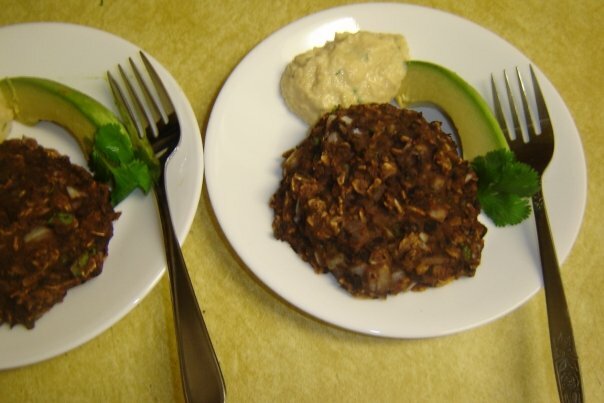 Sometimes I’ll make the hummus to go with black bean burgers. Barley, corn, and haricot vert salad: This salad is really simple to make, and it tastes pretty good. The dressing has an unusual taste, given that it contains Dijon mustard, shallots, red wine vinegar and olive oil, so you might want to put it on the side and let people sample it first. Butternut squash risotto: I made this for the Thanksgiving feast I had with friends last month. You can’t really go wrong with Giada De Laurentii’s recipes. After interviewing the Italian cooking pro last year in Dallas, I became an even bigger fan of her food and her approach to cooking. Giada’s butternut squash risotto recipe calls for a vanilla bean, but you could probably just use vanilla extract. I used a vanilla bean because I had never cooked with one before and wanted to see what it was like. The beans come two per pack and cost $5 a piece. They’re expensive, but I loved the added vanilla flavor they added to the risotto. 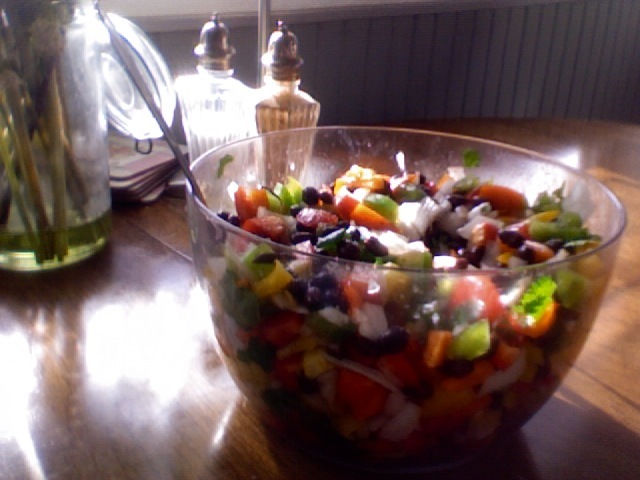 Black bean confetti salad: Again, a simple salad to make, and a great one for the summer. If you’re looking for some other quick salad options, check out these recipes on SmittenKitchen.com, one of my favorite cooking blogs. Double chocolate-cherry espresso drops: I made these for a cookie exchange I hosted last weekend, and they came out pretty good. I didn’t use the instant espresso powder that the recipe called for because I couldn’t find any in the store. I’m sure you could improvise, though, and just grind up some coffee beans for added flavor. Polka dot cookies (aka brownie cookies): These cookies are so easy to make and they’re usually a big hit. Try them! 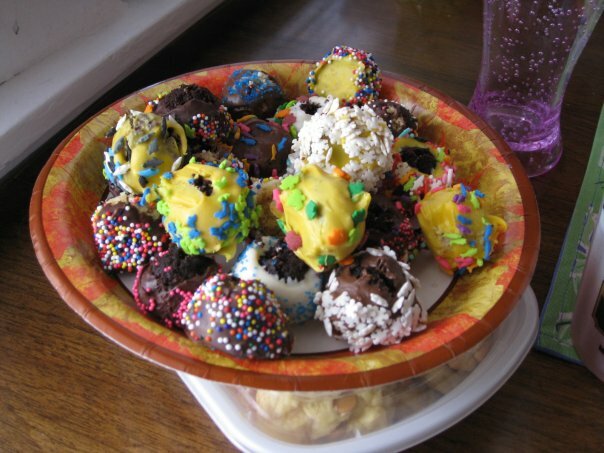 Cakeballs: A group of my friends and I got together last year to make these tasty — and sickingly sweet — treats. They’re especially fun to make and decorate around the holidays. Just make sure you have a lot of time … and patience.